You are here: Home » MEDIA » Movie books » Comic Book Movies :Quick Takes Movies And Popular Culture by Blair Davis (book review). 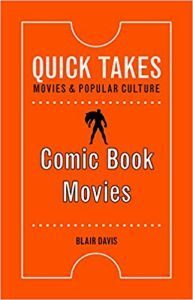 Comic Book Movies :Quick Takes Movies And Popular Culture by Blair Davis (book review). For a small book, I’m not sure if author Blair Davis is seeking to be comprehensive with ‘Comic Book Movies: Quick Takes Movies And Popular Culture’ or not. Certainly, his ‘Films Cited’ would appear to be that way. Then again, he does have a lot of problems in terms of his thinking he covers comicbook films. Then again, Davis has a serious problem on deciding what is a comicbook film as it covers so many genres. Personally, I would think if its source was a comicbook or a newspaper strip then it comes under the same category and only classed as a hybrid if it steps beyond its roots. Although there is a growing list of comicbook films, there are a lot of absences as well. Modesty Blaise (1966) could be easy to miss, but ‘The Phantom’ (1998)? There are other absences as well. Davis does urge his readers to react than read his book passively. I do think superhero films have breeched the niche fandoms a long while back or they wouldn’t be such massive earners. It’s either that or there have been a lot of closet comicbook fans in the past 30 years or so. If anything, it is the comicbooks that are being left behind now. The films haven’t even reached their peak yet. There’s been the odd misfire but that has to be expected. The fact that comicbook isn’t just super-hero should be significant. The real problem is the origin films. Yes, they are needed for some of them but to do it continually for the main super-heroes like Superman, Batman, Spider-Man and Hulk is likely to be detrimental because even non-fans can recite the event now. When it comes to the use of super-heroes in World War 2, Davis neglects to cover that it was something thin and light that American soldiers could carry in their kit bags for a quick read when they were overseas. When it came to films or serials based on the characters, the studios had neither the budget for special effects or desire for accuracy when they had to pay for the property. Working out the appeal of any comicbook movie to be successful when some aren’t it always going to defy analysis. So much has to click in the viewer’s mind to invest time to go and watch the film. With ‘The Avengers’ run franchise, you know there is a continuation of the growing fanbase. The likes of ‘Deadpool’ and ‘Guardians Of The Galaxy’ run against type so it has to be some other qualities that makes them attractive. I do agree with Davis in that none of these series need massive stars to make them sell but I said that myself several years ago. It is the quality of the acting than the who. Mind you, it has rapidly made stars of many of them as well. What Davis also fails to get is when it came to the Salkinds’ ‘Superman’ franchise is that they continually dropped the budget on succeeding films which on a special effects laden series isn’t the right thing to do. This wasn’t unusual in the 19710s as there were plenty of other examples. Davis only briefly touches on super-hero costumes. The problem tends to lie in film directors unsure if they can pull it off or make them practical. When you see the evidence of cos-players getting even super-hero costumes right, then you do have to wonder if they are right. Often, it’s a balance between fitting into a reality and a desire to show the actors sans masks. Considering the number of quotes Davis uses here, it does tend to cloud what he has to say for himself in such a small book. Certainly, his footnotes could have been put in the main text but he might have done that for his university credentials. « Superman: The Coming Of The Supermen by Neal Adams (graphic novel review).